I have to admit, I have never heard the album these two amazing musicians did together way back when. After seeing this live show, I will have to seek that one out. One can sit around and debate who the greatest guitarists ever are and surely each person will have his or her own list. 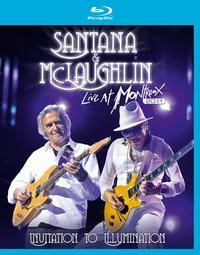 The thing is, Carlos Santana and John McLaughlin would probably make most lists. Then, when you consider how unique each sound really is, that makes them both very important guitarists. Well, then let me pose this question to you: How often do you get to see two guitarists of this skill level playing on stage together? I’d have to say that it very seldom happens. That makes this a very special concert experience. To have it to watch at home is definitely great. Their set consists of a wide range of music, from fusion to blues rock to rock and more. I figure that lands it in the progressive rock heading. It also lands it in incredible territory. For my money some of the highlights include their interpretation of “Stairway to Heaven” and the intimate seated guitar duo performance. Rather than have each artist perform with his own band, both play with the same group of extremely talented musicians. Both guitarists get parts of the set where they perform without the other, but for my money, the interplay between the two is the real magic. The video and audio both are impeccable. If you like guitar music, you must own this. It’s not optional.